The 2014 year in the Russian metallurgy sector will be mostly remembered for the events connected with Russian mining and metals group Mechel. The most indebted miner in the industry lost the bigger part of its market value this year. It was threatened by bankruptcy, it was offered to sell assets, restructure debts, or convert it into shares. Major shareholder and CEO of Mechel Igor Zyuzin was threatened by suspension from the control over the company, however, there are currently no exact decisions on the company’s future. In February, the company had first problems on the stock exchange, when its shares slumped due to unknown reasons, but the analysts were saying that it was due to debt covenant problems. The manipulations with the company’s shares were ascribed to speculators, while the central bank said it would look into a matter. But nobody imagined that it would go so far. Still, the company had positive news this year, including the sale of some assets, while its debt narrowed due to the ruble devaluation. The second major event this year, not only in the metallurgy industry, is the weakening of the Russian ruble. The exchange rate of the Russian ruble against the U.S. dollar slipped more than 60% this year because of low oil prices, geopolitical tensions between Russia and Ukraine, as well as introduced sanctions against Russia. The weakening of the Russian ruble is negative for companies-importers, while exporters are benefitting. Roman Tkachuk, analyst at Nord-Capital, considers the ruble devaluation the major driver for the industry sector. “Exports account for the bigger part of Russian metallurgy companies’ sales, while the expenditures they incur are in rubles, excluding the debt servicing (Mechel, RUSAL, Evraz). The weak ruble makes the companies more competitive on the global market (due to low production costs), and it leads to positive revaluation of the company’s profits”, the analyst said. Andrei Shenk, analyst at Alfa-Capital, has a similar point of view. “The bigger part of the metallurgy companies – are exporters, or companies, which may easily switch from the local market to exports, such as MMK. The prices in rubles have increased, while production costs remained unchanged, which led to growth in profitability. As for ferrous metals industry, there were additional drivers, such as the decrease in iron ore and coal prices, which also resulted in growing profits”, Shenk said. Estimating the results and the condition of Russian companies, we may name metals giant Norilsk Nickel “the company of the year”. Already in 2013, the company left all discrepancies in the company’s management, which were an obstacle for the company’s development. Under the management of Vladimir Potanin, the company shifted the focus to mining, which became the foundation for the company’s stable development. In the frameworks of the revised strategy, Norilsk Nickel had successfully sold a part of its foreign assets in order to focus on Russian assets. “The company was supported by high nickel prices, as well as plans to spend around $400 million from the sale of non-core assets on dividends, besides up to 50% of the EBITDA. As a result, the interim dividend amounts to 762.34 rubles per share (which corresponds to 8% yield)”, Roman Tkachuk said. Under our estimates, Norilsk Nickel may share its place of the “Company of the year” with aluminum giant RUSAL. The company had problems in the recent years with its debt burden and low aluminum prices. Investors had low interest in the company’s shares because nobody believed in growth, however, the situation changed significantly. “Even the CEO Oleg Deripaska decided to leave his CEO post. He headed the company in the difficult times, while his departure means that the “hard times” for the company had ended”, Tkachuk also said. The firm growth of aluminum consumption in the world, taking into account the fact that the company had reduced production volumes by closing outdated capacities, as well as reduction of LME stocks, led to the aluminum deficit globally. All the above-mentioned facts cannot but influence the company’s market value and led to turbulent growth of stock prices amid the ruble weakening. “Certainly, the leader of the nomination (company of the year) is RUSAL, which Russian Depositary Receipts (RDR) skyrocketed 280% since the beginning of the year. The reason of the dynamics is the revaluation of the company amid the growing aluminum prices and weakening ruble. As a result, the company’s EBITDA margin may grow to 14% this year. Debt restructuring in the first half of the year also became a positive factor”, Andrei Shenk said. Unfortunately, besides Mechel, which holds the nomination of “the failure of the year” for the fourth consecutive year, it now shares it with the pipe maker TMK. It is not due to high debt burden, but the unfavorable concourse of circumstances, which include low oil prices, reduction of investments by oil companies, as well as termination of the South Stream project, which became the main hit for the company, which lost already more than 50% of the market value. “Besides Mechel, TMK demonstrated the worst dynamics – the drop of 56.94% from the beginning of the year. It is due to the lack of vertical integration – the growth in steel prices in rubles due to devaluation led to the growth in pipe production costs and deteriorated forecasts for 2014 and 2015. The termination of the South Stream project also “poured oil on flames”, as well as falling oil prices, while a number of oil companies have started reducing their investment programs, which may lead to the decrease in demand for pipes”, Shenk said. In the second half of the year, the company’s shares were sold out amid the news on the termination of the South Stream project, as well as stalled negotiations on the construction of a gas pipeline to China. “Previously, investors included the projects as a guarantee of future demand on pipes, but the geopolitical situation for the year had changed. Moreover, a big seller was identified in TMK shares, it may be one of the company’s shareholders”, Tkachuk said. The trend of the ending year, as well as of the 2013, was optimization. In 2013, the metals and mining companies managed to significantly cut expenses, but this year, the companies have solved the other goal - sale of non-core and loss-making assets. Norilsk Nickel successfully disposed of Australian and African assets, Severstal sold U.S. steel smelters and PBS Coals coal producer, while Evraz sold Czech steel smelter and agreed to sell the vanadium subsidiary in Africa. Mechel is also in the advanced stage of divestment process. The company agreed to sell the Moscow Coke Plant. 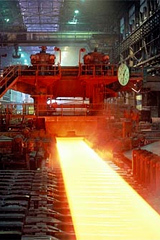 It is in the negotiations to sell the Kuzbassenergosbyt and the Bratsk Ferroalloy Plant. It had earlier put the U.S. coal producer Bluestone up for sale and the Ukraine’s Donetsk Metallurgical Plant. Besides that, Mechel is searching for an investor for a stake in Elga coal project. It is without doubts that the realization of these deals will be positive for the company. But, there is a “fly in the ointment”, because there were some good deals this year, which did not complete. The transaction between ALROSA and Rosneft, which was not completed because the latter needed some additional review of the asset. Another deal, which could be successful, is the merger deal between Russia’s intergeo and Canada’s Mercator Minerals. Due to several postponement of the transaction’s clearance by the Russian Antimonopoly Service, Intergeo decided not to proceed with the deal, while Mercator was later forced to file for bankruptcy. Despite the gold price fluctuations on the global market, which was mainly bearish, the precious metals prices in Russian rubles were growing along with the strengthening U.S. dollar against the ruble, which made attractive the investments in gold, as well as in gold mining companies. “Polyus Gold and Polymetal were in demand amid the talks that the Finance Ministry may start buying gold produced in Russia. The additional factor of growth in Polyus Gold stocks was an interest in Natalka deposit from Chinese investors”, Tkachuk added. There were two large and significant deals connected with Polyus Gold this year. The first fact is that the company decided to indefinitely delay the Natalka project due to downward revision of reserves and resources. “Preliminary findings suggest a 15%–20% downward revision in the resources to 48 million–50 million ounces and a 55%–65% reduction in the reserve estimates to 11 million–14 million ounces due to a change in the interpretation of the deposit mineralization”, the company said then. As of now, the company has already invested 41.9 billion rubles in the Natalka project, according to the company's representative. The commissioning of Natalka was initially scheduled for June–August 2014, but in December 2013, Polyus Gold announced the decision to postpone the development of the project to June–August 2015 due to a material gold price decline. Also, Polyus Gold made an unusual decision and agreed several hedge deals on the sale of 2.83 million ounces of gold by mid-2018 under several schemes, which will protect the company from gold price fluctuations. It was the first time the company agree a hedge deal in comparison with other Russia-focused gold miner Petropavlovsk Plc. Gold miner Nordgold is also considering a possibility of a short-term hedge deal, while Polymetal, which had a “bitter experience” almost a decade ago, is still against such kind of agreements. The year appeared to be not so bad for a bigger part of the metallurgy companies, which are now gaining profits from the ruble devaluation and will continue to be in that shape because the U.S dollar is unlikely to return to the level of 34 rubles soon.